Were you searching for Bungie Studios, the video game developer? This article is about Bungie Studios' website. For other uses, see Bnet. Bungie.net is the main official portal of Bungie Studios, the developer of Halo, Myth, Oni, and Marathon, and the only site for interaction between company staff and the community surrounding Bungie's games. Before Bungie was purchased by Microsoft, Bungie.net was used to host and play the Myth series of games. In addition to being the main portal to all official information about Bungie and their games, Bungie.net also operated as a statistical database for the games Halo 2, Halo 3, Halo 3: ODST and Halo: Reach. Bungie.net retrieved data directly from the Xbox and Xbox 360 LIVE servers and stored it in its databases. Every Xbox LIVE player that participated in a match of a Halo 2, Halo 3, Halo 3: ODST or Halo: Reach prior to April 1, 2012 had an account created on Bungie.net automatically. Bungie.net transferred all of its record-keeping responsibilities to Halo Waypoint on March 31, 2012. Bungie.net began life in 1996 as Bungie.com, a community/business website covering Marathon and previous projects. Even in the beginning, classic pages such as "Letters to the Webmaster and Soapbox" existed, if in a somewhat graphically inferior manner to the later versions. A few layout and content updates ensued throughout 1997 until at the end of the year, consequent of the release of Myth, Bungie.net was born, serving as a community, statistics and multiplayer metaserver. Bungie.com remained to cover the business side, while its sibling thrived. With the release of Myth II at the close of 1998, the site was further updated and now supported the multiplayer sides of both games. On March 31, 2012 Bungie.net transferred the last of its record-keeping responsibilities to Halo Waypoint. Although statistics and files collected prior to that date are retained, the information is no longer updated. Players are also no longer able to change their Nameplates. Bungie.net is an extremely successful and enjoyable online community, and that's mostly because of a member's ability to interact with the site and other members. Although there are different ways of doing this, the most widespread and popular is posting in the forums. Inside these, any registered, non-blacklisted member may create or reply to a topic. Members cannot create new topics in the Voting Booth or The News unless their accounts have a certain level of security clearance. Bungie Universe Forum— Formerly known as The Underground - Discussion of all things Bungie. Bungie.net Community Forum— Formerly known as The Septagon - Talk about community stuff here. Halo: Reach Forum- Topics concerning the game Halo: Reach. Halo 3: ODST Forum- Discussion relating to the Halo 3 expansion, Halo 3: ODST. Halo 3 Forum — All subjects regarding Halo 3's campaign or otherwise are located here. Halo 2 Forum— Formerly known as New Mombasa - Anything and everything related to Halo 2. Halo 1 & 2 For PC— Formerly known as The Maw - Discussion of Halo and Halo 2 for the PC. Halo Combat Evolved Forum— Formerly known as The Library - General Halo Xbox discussion. The Gallery Forum—Crazy pictures from Bungie and fan-created art goes here. This forum hosts the occasional Caption Contest. The News Forum—Bungie's top news stories go here. Whenever you see a Weekly Update or other announcement on the front page, a corresponding thread for discussion of that story automatically appears in The News. The Classifieds—Advertise for your Halo 2 clan, Bungie.net chapter, or other general recruting here. Off-Topic Forum: The Flood— Formerly known as The Flood - Off-Topic forum; use at your own risk. Users have the ability to create their own private groups (also known as Chapters) on Bungie.net. A private group consists of a private forum and is moderated by the members themselves. The group founder has the ability to accept and reject members and give other people moderator powers. Bungie also does a private group spotlight and gives one of the Bungie.net groups the ability to control Bungie Favorites for two weeks. The moderators on Bungie.net are volunteers from the community who donate their time and patience to help maintain some peace and order on the forums. They primarily work to combat spammers and rule violators while also helping to answer questions and welcome new members. If a moderator sees a thread that doesn't belong in a forum, they will move it. If it's an inappropriate thread, they will lock it. The moderators also report members who violate Bungie's rules to the Bungie team so they can follow-up as appropriate. Bungie.net has a total of 3 million pageviews per day and accumulates over 300 GB of data a month of online game statistics from the almost 1 million online games played every day. Occasionally, Bungie.net will have comical messages in the title bar such as "Satisfy Your Grunty Thirst", "Our Webmaster Wears a Gorilla Suit and a Jetpack" and "Don't use -blam-!". Bungie.net's design and inventive features have not gone unnoticed, since it was rated as the "Most Innovative Design" by IGN Entertainment in 2004. The site also exceeds a 99 percent up-time ratio even through peak usage periods such as the week of the Halo 2 release. The "search" button for the search bar of the site is actually the Marathon symbol, tilted on its side to resemble a magnifying glass. President Harold Ryan's apology letter for postponing the announcement of Halo 3: ODST. Bungie.net homepage in February 2010. 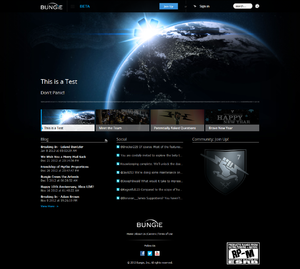 Bungie.net homepage in September 2010. Bungie.net's homepage in April 1, 2012.